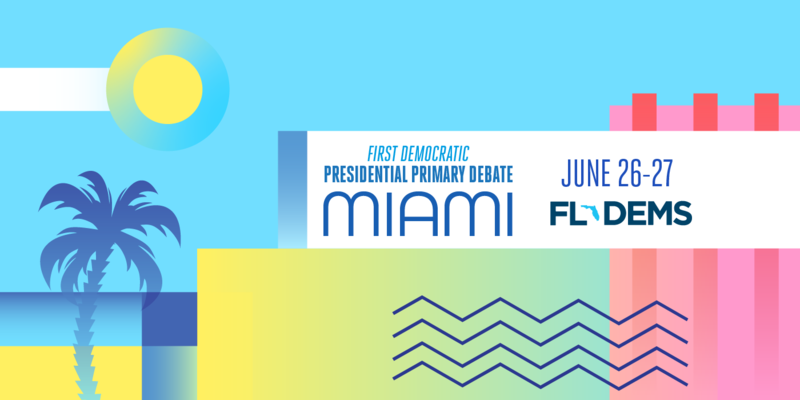 Today, the DNC is proud to announce that the first presidential primary debate, broadcast live on NBC, MSNBC and Telemundo, will be held in Miami, Florida. The debate will take place in prime time on back-to-back nights on June 26 and 27. The debate will be broadcast live across all three networks with real-time Spanish translations on Telemundo. Our broadcast partners are fully committed to providing accessible communications for deaf and disabled viewers as well. The debate will be streamed for free on NBC News' digital properties, including NBCNews.com, MSNBC.com, NBC News Mobile App, and OTT apps in addition to Telemundo's digital platforms. The debate lineups for each night will be determined at random to provide each candidate with a fair opportunity to make his or her case to a large, national audience. Additional details on the venue, moderators, communication accessibility, and timing will be announced at a later date. "Miami is a vibrant and dynamic city that reflects the values and diversity of the Democratic Party. I couldn't imagine a better setting for our first debate," said DNC Chair Tom Perez. "Throughout every step of this process, we've focused on empowering the grassroots and ensuring that we hold the most transparent, inclusive, and fair primary in our party's history. I'm thrilled that we'll get the chance to showcase our terrific candidates to voters in Florida and across the nation." "Miami is the perfect place to introduce our extraordinary presidential candidates to the country," said Florida Democratic Party Chair Terrie Rizzo. "When they take the stage, they're going to show the American people that the Democratic Party is the party of ideas. We're fighting to empower voters, expand opportunity, and build a brighter future for all Americans. People are hungry for new leadership in the White House, and after the first debate, they're going to be fired up and ready to organize for Democrats."